These are two similar quadrants engraved in the same way. 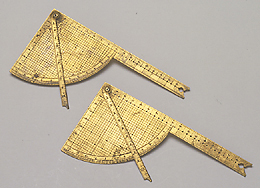 The instruments consist of an actual quadrant with an extended arm on one of the edges. The limb is engraved with an equal scale divided to 1/2, 1/4 and 1/8 from  to 12, numbered from 1 to 12 by 1. On the short edge is a scale, divided to 1/2 and numbered from the apex from 1 to 7, with dots each unit. The extended edge is engraved with the same scale but numbered from to 8 up to the limb and then again from 1 to 8 on the extension, with dots each half unit. The end of the arm has a decorated profile. The surface of the quadrant is engraved with a sinecal quadrant, with dots each unit. The other side of the quadrant is engraved in the same way, and has a radial rule fixed to the apex. The rule is engraved with a similar scale, divided to 1/2 and to 1/4, numbered from 1 to 10 starting from the apex.